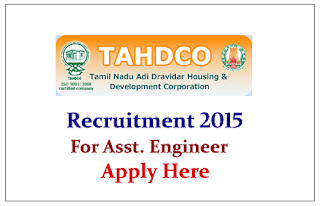 Tamil Nadu Adi Dravidar Housing and Development Corporation Limited (TAHDCO) is recruiting for the post of Assistant Engineer. 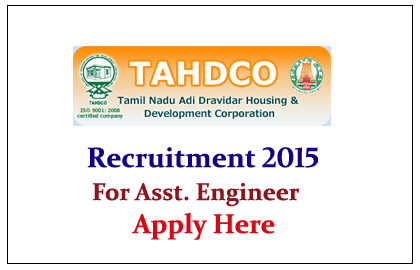 Interested and Eligible candidate can apply on or before17th July 2015. Company Profile: Tamil Nadu Adi Dravidar Housing and Development Corporation Limited (TAHDCO) was incorporated in 1974 under the Companies Act, 1956. The Government of Tamil Nadu and the Government of India contribute to the Share Capital of the Corporation. At present the Authorized Share Capital of the Corporation is Rs. 100 Cr and paid up share capital is Rs.95.12 Cr. The State Govt. and the Central Govt. contribute the share capital in the ratio of 51:49. How to Apply: Interested and eligible candidate should send filled application form with self attested copies to below mentioned address on or before 17.07.2015 by 5.00-pm. For more details kindly check official notification.